═══════════════════════════════ C indy Lyon & Daniel Yohalem - Temple Beth Shalom in Santa Fe, NM Rabbi Moshe Druin made everyone feel welcome and connected to the Torah. He valued the importance of having women participate fully in this project, which was very important to our congregation. He was thoughtful, respectful, open, interesting, spiritual, funny, and engaging. We learned many interesting things about the calligraphy and style of our Czech Torah, and the Montefiore Las Vegas scroll, which has even older, Kabbalistic details. The structure of the scribing sessions was very effective. We added our own details such as the rock painting project to commemorate the letters and the Talk Torah area where people chatted with our Rabbi, Chazan and educators about their birth portions and their connection to Torah. Most participants found the experience deeply moving. We could not have created this learning and spiritual experience without the guidance, leadership and participation of Sofer On Site. Another example of Sofer's leadership was the Closing Ceremony. We might not have known the importance of a closing ceremony had Sofer not suggested it. Having congregants watch as the last letters were scribed and the scroll was stitched back onto the Aytz Chayim was moving and gave us all a feeling of connection to the Torah, accomplishment and closure. Overall, this has been a rewarding and important learning and community building process for Temple Beth Shalom. Most importantly, we have a restored Holocaust Torah and a vibrant part of the congregation who participated in this process. Thank you for working with us to make it happen. ═══════════════════════════════ R osemary Lieberman - Torah Project Management - B'nai Israel Synagogue - Pensacola, FL Dear Rabbi Salazar and Rabbi Goldstein, I just got home a little while ago from the synagogue and today's wonderful closing ceremony and felt that I must send out an immediate thank you. A more formal thank you will be forthcoming to both of you from the committee. I cannot tell you how thrilled we were with our wedding closing ceremony. The ceremony was incredibly beautiful and Rabbi Salazar you were amazing; I cannot tell you how many glowing compliments I received about you. While our congregation is indeed small, we made a huge accomplishment today! In addition to the closing ceremony, I also scribed today and the entire experience was so uplifting. I really don't have the words to explain, but I have never felt the feelings that I felt today. I feel that my soul is glowing! I must also say Rabbi Salazar, that you are one of the most unflappable persons I have ever met! You are such a credit to Sofer On Site. In addition, our project would not have been a success without the diligence of Rabbi Goldstein and his assistance and yes, nudging when needed. In each dealing I had with you Rabbi Goldstein, you were professional, patient, and creative. I felt very blessed to have you on this project along with your creativity. Our committee was a small one and we weathered many challenges, but dealing with you wasn't one of them. 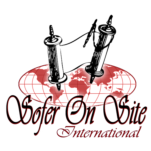 From the bottom of my heart to both of you and to the entire Sofer On Site organization, thank you, thank you, thank you! With warmest personal regards, Rosemary _________________ Samuel W. Bearman - Marketing & Publicity - Chair - B'nai Israel Synagogue - Pensacola, FL Dear Shmuel, Sofer On Site was terrific. Everybody with the organization was very kind and everything that we were told would be done, in fact, was done. The New Torah Project has been wonderful in so many ways and we are the very proud owners of a new Torah. ═══════════════════════════════ M argaret Debbané - Temple Sholom Vancouver BC Dear Rabbi Druin: I was very touched by participating in yesterday’s scribing activities. The brief yet powerful experience unfolded so well for participants: the activities in Sarah’s Tent were full of new information; the hands on experience with a Torah was a beautiful way to have practical content with targeted knowledge (e.g. the first song included in the Torah and being able to experience it visually); the participation in hand washing which inculcates the experience with solemnity; and, finally, the scribing and dialogue with you when you so beautifully illuminated your interpretation of the letter I wrote. I was Head of Public Programs at the J. Paul Getty Museum for many years - and I would say that the “gestalt” of my scribing experience yesterday was PERFECT as an intimate yet public program. The short yet structured time that is created for each participant allows one to come away with an enriched understanding of Torah - and a new respect for it. I am grateful to have had this scribing experience. All the best, ═══════════════════════════════ F rances B. Pearlman - Director of Lifelong Learning - Congregation Habonim, NY, NY Recently Rabbi Gedaliah Druin from Sofer On Site visited our school. His first group of 4th & 5th grade students was fairly large- about thirty students. He was engaging, entertaining as well as provided a wonderful educational program. He knew just how to engage students both individually as well as to attend to the needs of the group at large. Every student was attentive and was in awe of his talents and the process he was sharing. He held their attention for a full hour. The second group of 6th & 7th grade students was significantly smaller and he artistically adjusted his presentation to meet the needs of this size group. He was able to address the individual questions of the students and to engage all of the students for an entire hour. Another remarkable aspect was the personalization he incorporated by scripting the children’s Hebrew names. Sofer On Site was a pleasure to deal with and was responsive to emails while we made all the arrangements. Sincerely, ═══════════════════════════════ C huck London - Religious PracticesTemple Beth Shalom, Fort Walton Beach, FL Shalom Rabbi Bialo, I just need to let you know we had a wonderful day with Rabbi Salazar. During the morning, we had members and school students writing the letters. He provided wonderful explanations and was especially good with the kids. His lecture was exceptional. He was informative, entertaining and inspiring. After the presentations, he completed more letter writing with the congregation. As a congregation, we have a greater understanding and appreciation of the meaning of Torah, and our Torah in particular. Thank you for all your help and good work, with a special thanks to Rabbi Salazar. ═══════════════════════════════ J udi Snyder - Beth El Congregation - Baltimore, MD Dear Rabbi Druin, I cannot even begin to express how thrilled I was to see you today and get the once in a lifetime opportunity to scribe a letter! Weeks ago Howard's mother told me about your repairing the Torah at Baltimore Hebrew Congregation and asked if I thought this was something that she should do. I of course told her that meeting and scribing a letter and having the chance to hear your precious words was an experience that couldn't be missed. And I asked her if Howard and I could share the moment with her. She seemed happy that we wanted to be with her. SO - I thank you once again for enlightening and inspiring me and for helping me know your precious message to me. It has lightened me and will help to make me a better and more forgiving person. You are a blessing to all who have the pleasure to know you! ═══════════════════════════════ R abbi Mark Asher Goodman - Rabbi Mark Asher Goodman - Denver Jewish Day School Sofer On Site and Rabbi Druin gave a tremendous, one-in-a-lifetime experience to all of our students. It was the perfect example of how experiential education can be the most powerful learning of all. Our kids not only heard how a Torah was written, they held the materials, smelled the parchment, and even wrote the letters themselves. Not just a mitzvah; a mitzvah that our students will remember for the rest of their lives! Chag Urim Sameach. L'Shalom (In Peace), Rabbi Goodman ═══════════════════════════════ L uis R. Dorfman - Executive Director, Congregation Beth Yeshurun, TX We are so pleased with the results of our Renewing the Promise Torah Scribing Project that was recently completed . And we have a beautiful new Sefer Torah as a result. Your guidance throughout the project was superb and contributed greatly to our success. Our congregants enjoyed the scribing experience and learning from your sofrim. Your sofrim who visited were learned and extremely personable. Everyone who scribed had nothing but great things to say about them - how they explained the significance of the letters and the words, how important they made our congregants feel. Your entire team supported us and helped us all the way through -- from the preliminary planning through the execution, from the opening kickoff through the dedication. There's no way we could have done this without you. Todah Rabbah.